1) Spend an evening train watching at the town of Silla 10km south of Spain’s third largest city Valencia. The town has a container terminal – an overflow facility for the terminals at the port (the largest in Spain – larger than Felixstowe in the UK). 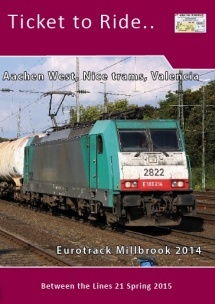 The station is on the mainline to Alicante which is a mixed traffic railway. We see TALGOs and AVEs, loco hauled trains and busy little EMUs bustling their way to Valencia. 10 mins. 3) Train watch at Aachen, the border city with Belgium. This is the stomping ground of the blue liveried SNCB TRAXX MS machines that ply the Montzen Line from Cologne to the ports at Zeebrugge and Antwerp and the steel mills at Liège. 40 mins. Bains sur Mer- 1:32 scale narrow gauge railway in the 1950s set in Picardy. Rhineside - a TT (1:120) scale representation of the Rhine right bank railway south of Koblenz. Tachov Urnichaz Czech secondary line epoch 4 & 5 H0. Filmed in HD, narrated. Double DVD RT 2hrs.